This is the third and final part of my Cape Wrath experience. We completed the walk the previous year but wanted to try some alternative routes. 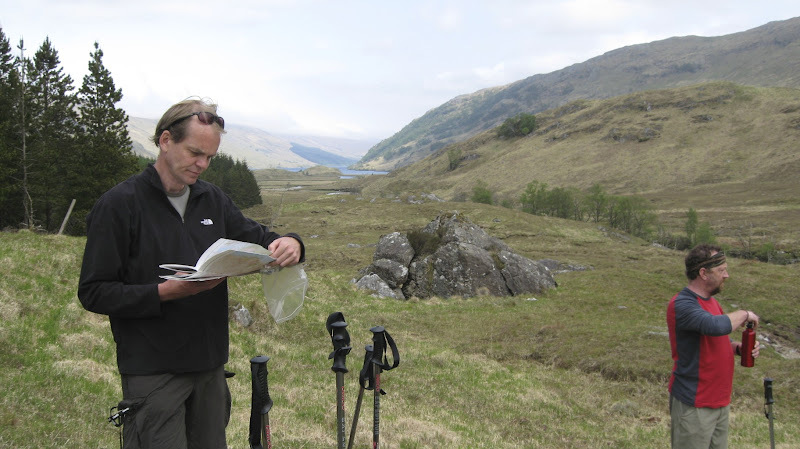 As I said in my last report the walk is pretty much agreed from Morvich to Cape Wrath but there are variations from Morvich to Fort William. 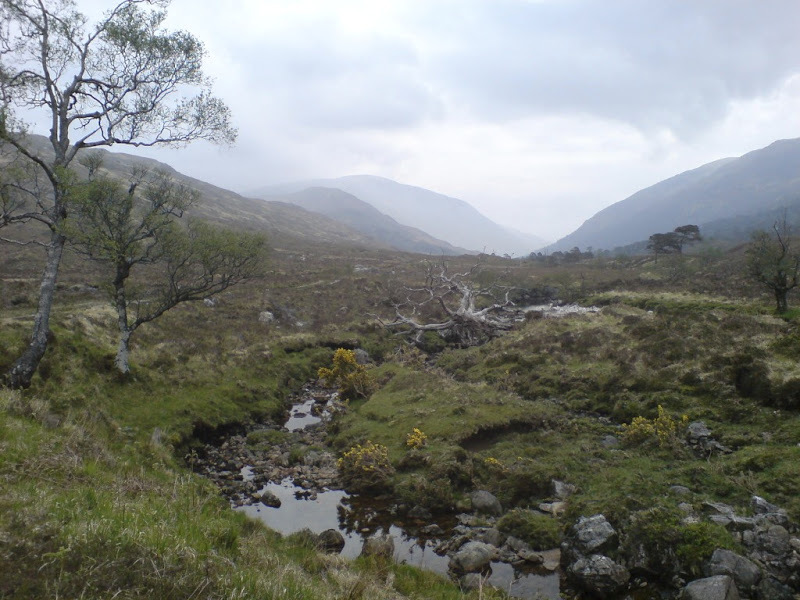 For this walk we decided to start in Fort William and walk to Morvich via Glenfinnan and Barrisdale. This is a fairly standard route, indeed it is the one taken by most walkers. On arrival in Morvich we didn’t want to go over old ground so we planned to go to Glen Affric via Glen Lichd and walk out to Invermoriston from where the route could link with the Great Glen Way into Inverness or Fort William. Stuart had dropped out so there were just the four of us. We planned to stay in Hotels, bunkhouses, B&B’s and the tents where required. One of us needed a new tent. 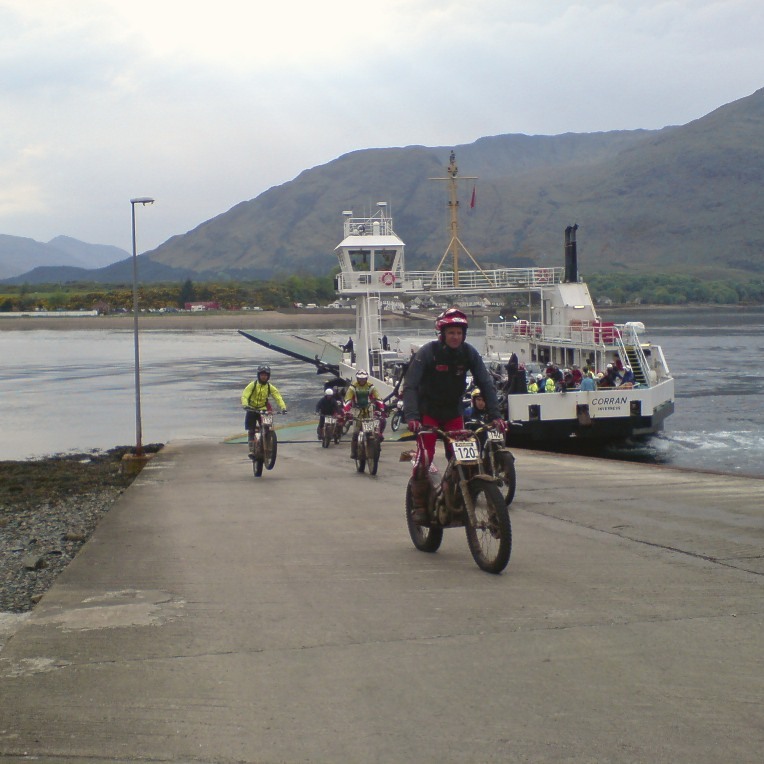 We arrived in Fort William by train and took a taxi down to the Corran ferry. 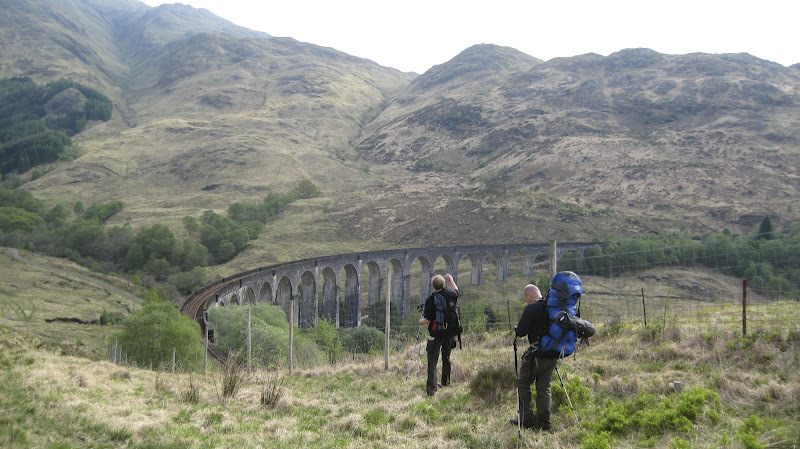 I highly recommend using this route as opposed to taking the train up to Glenfinnan. There is nothing like starting a walk with a ferry ride, and we didn’t. 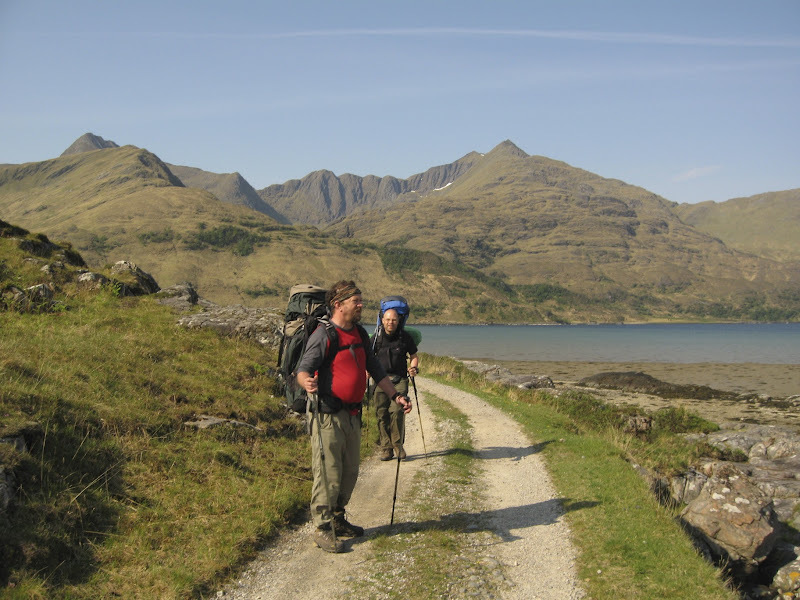 We crossed over but then spent the night at the Inn at Ardgour. The days activities took their toll on Jim, he and Simon were drinking on the train. Once they reached the Inn, where there were many bikers watching an international motorbike trial, they continued in earnest. By late afternoon Jim had cracked and went to bed, he didn’t surface again until breakfast. After breakfast the hotel owner kindly gave us a lift to the entrance to Cona Glen, free of charge. This Glen is very pretty and it would seem rarely walked, we didn’t meet another soul all day. It was a fairly uneventful day, mainly due to our using a map correctly. The main amusement was provided by Simon, who seemed unable to use his new lightweight pack in the most efficient way, all manner of things were dangling off it, negating any of its benefits. 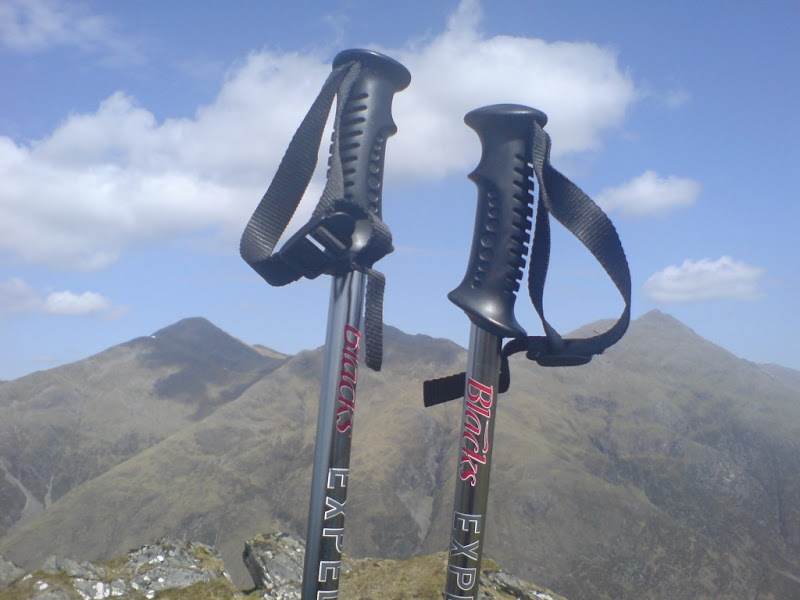 Also Jim had succumbed to the walking poles but clearly was having trouble coming to grips with them. 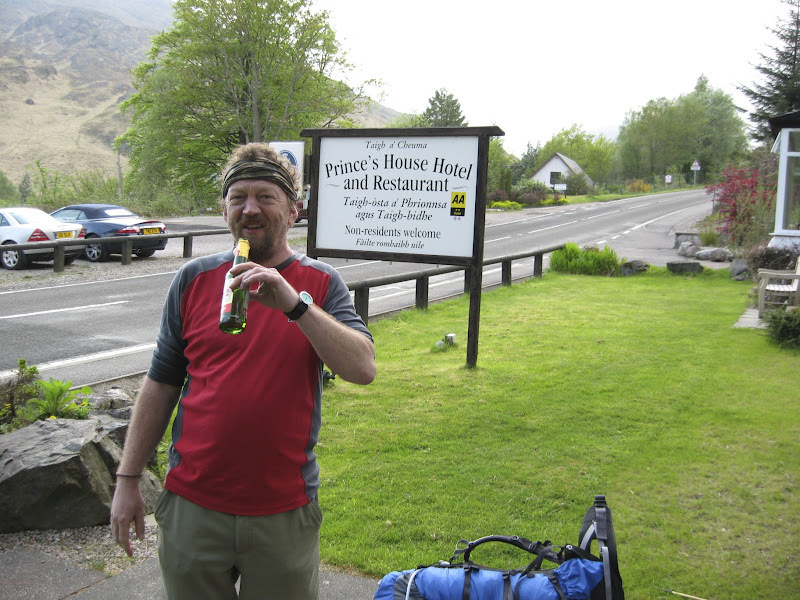 We exited the glen in the direction of Callop, crossed the river and then trudged down the A830 past the monument and on to the Princes House Hotel where we had booked in for the night. Jim was soon sampling the contents of the bar. The plan for today was to get to Sourlies Bothy and camp the night, as always things didn’t quite go to plan. 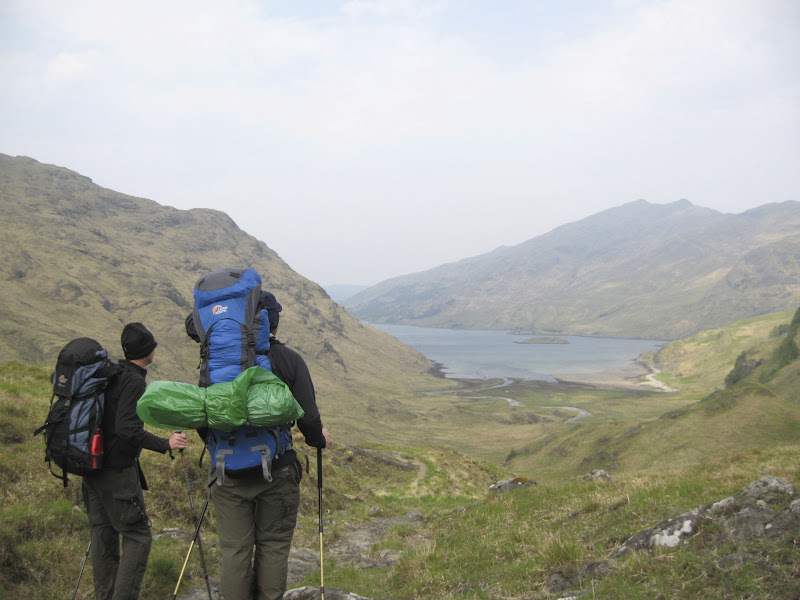 The weather was great, but the footpath quality was variable and our packs were way too heavy. Jims was of course the heaviest, no surprises there. He had also agreed not to be so selfish with his energy bars this time. We passed under the viaduct and headed to Corryhully. The bothy here is not quite as good as posh bothy but pretty good nevertheless. We had a cuppa and pressed on. The path up to the bealach a Chaorainn is very good, but does eventually peter out. We passed through the gate, which I think must be made a tradition for any aspiring Cape Wrath walker. 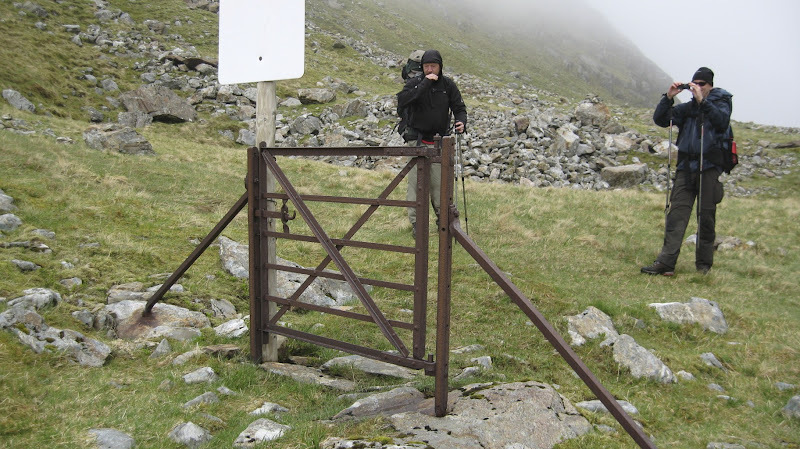 Surely there should be a website set up to publish photos of useless gates in the Scottish highlands. I have a small collection of them now. Once over the bealach the path is not very good, the view is pretty awesome though (weather permitting). 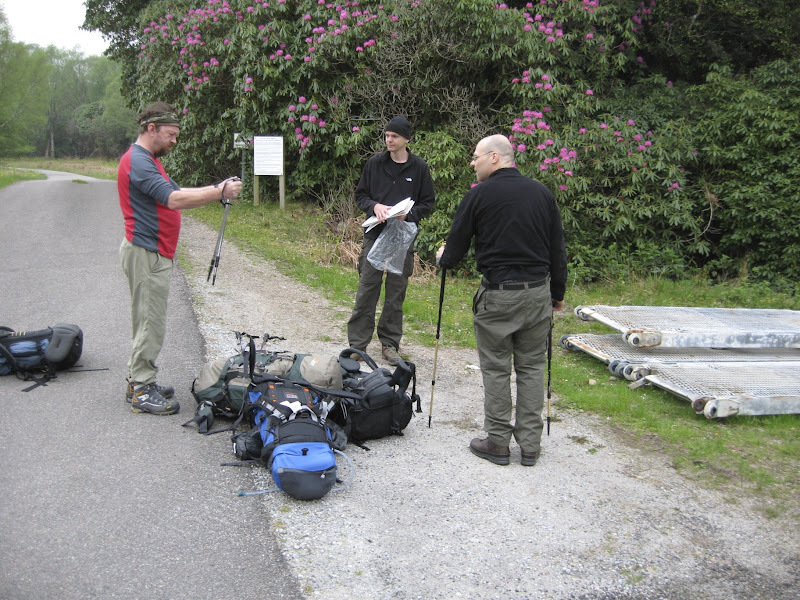 We trudged down to Strathan and stopped to chat to some Munroists camping by the river at Tom na h-lolaire. We were still undecided as to which route to take. 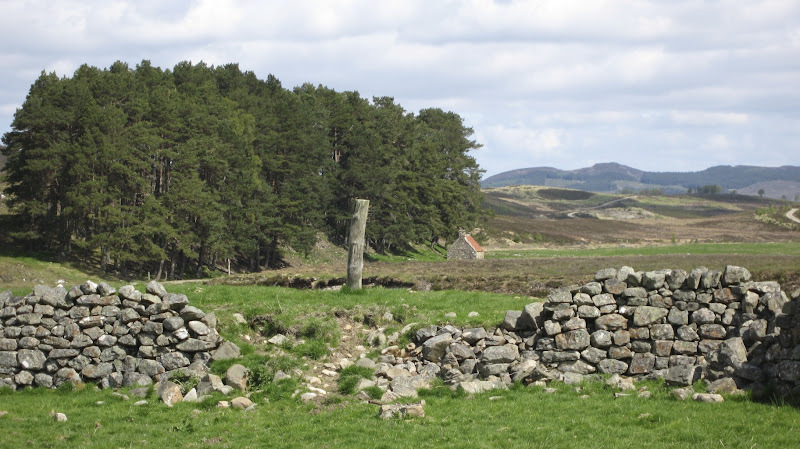 Either past the bothy at A’Chuil or past the lodge at Glendessarry. 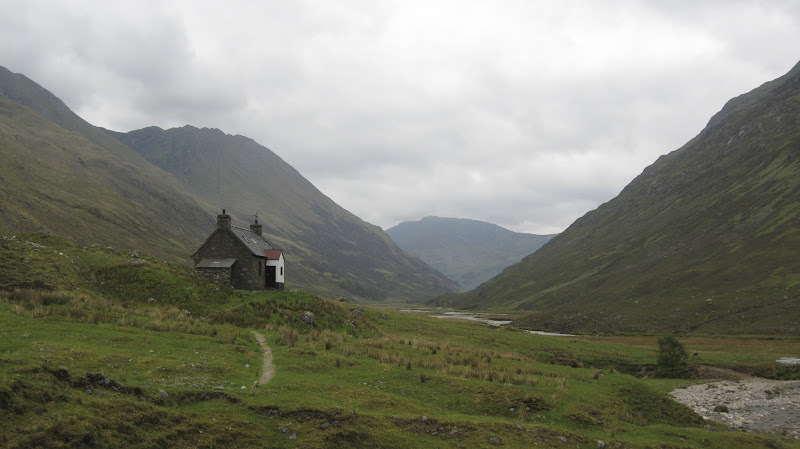 Eventually we decided to go via the bothy and cross the river Dessarry further up the glen. We didn’t visit the bothy and another hiker advised us not to go through the woods in upper Glendessarry as it was very boggy. 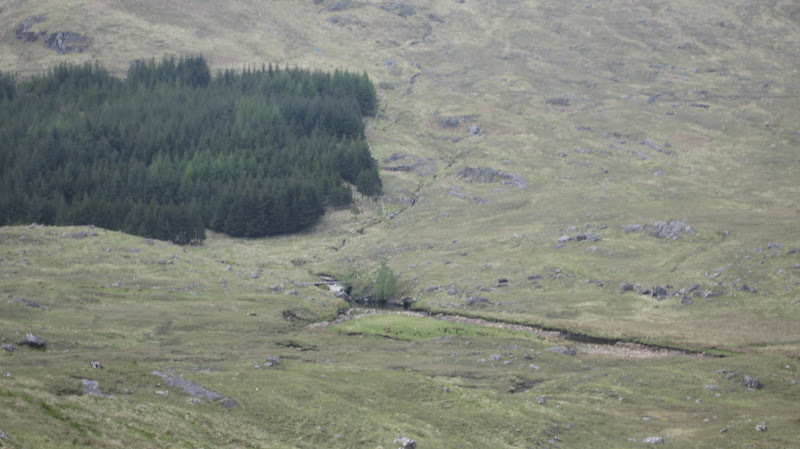 We therefore crossed the footbridge below the bothy and climbed up to the path alongside the plantation. 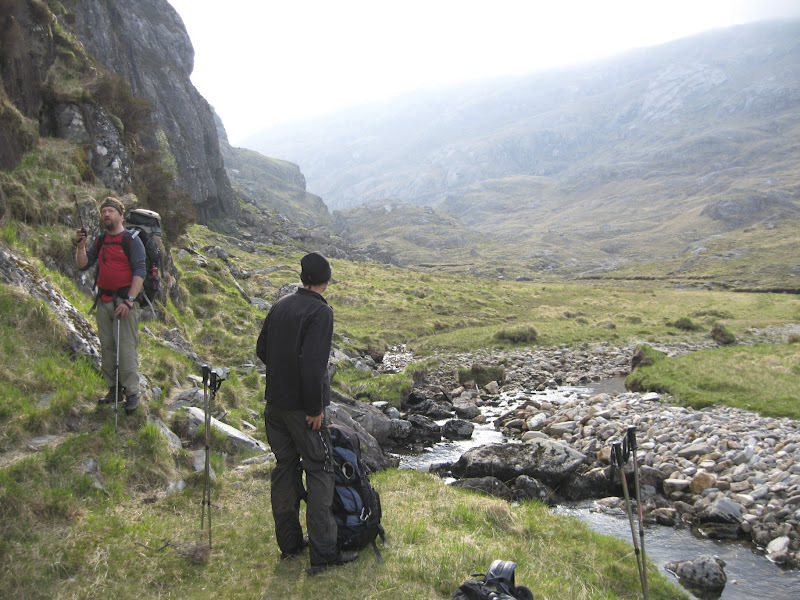 By the time we reached the start of the bealach an Lagain Duibh we had had enough and pitched camp. Jims flash new tent got its first outing and was clearly not a cheap one. One lesson learnt, however the inevitable bottle surfaced so not all lessons learned. The drawback of stopping early is further to walk the next day, we broke camp early but had to wait for Simon, he has one pace only and won’t be rushed. In the end we left him and pressed on to the top of the bealach. We waited for him at the far end of loch at the crossing point at Creag a Fhitich. 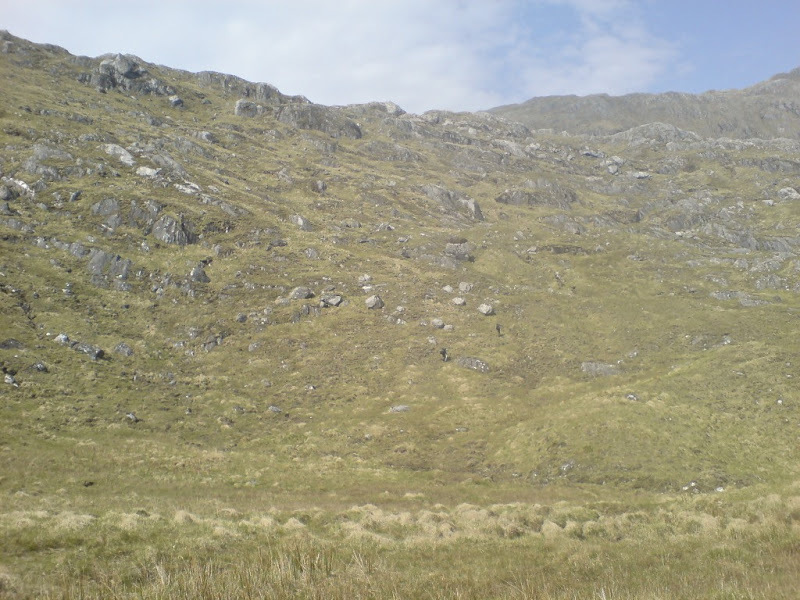 The path beyond here seemed a little confusing and it would be quite easy to take the route up to Sgurr na Ciche. The drop down to Sourlies was accompanied by more great views. The bothy was empty and pretty untidy. We stopped for breakfast and cleaned it up. The tide was out so we were able to get around the headland after breakfast and on to Carnoch without getting our feet wet. We continued to make good use of the map despite following the rather obvious river Carnach. 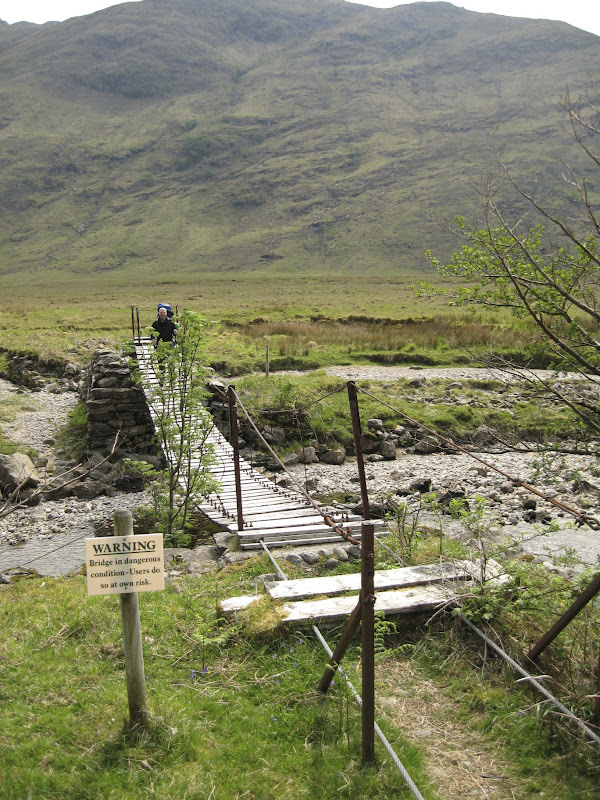 There is a bridge over the river, although it is a little rickety, I’ve seen worse though. There was more than one discussion about the right direction to take; this was particularly so higher up the river where there are two routes on the map. The lower one is much trickier and I would advise anyone to use the upper of the two paths. 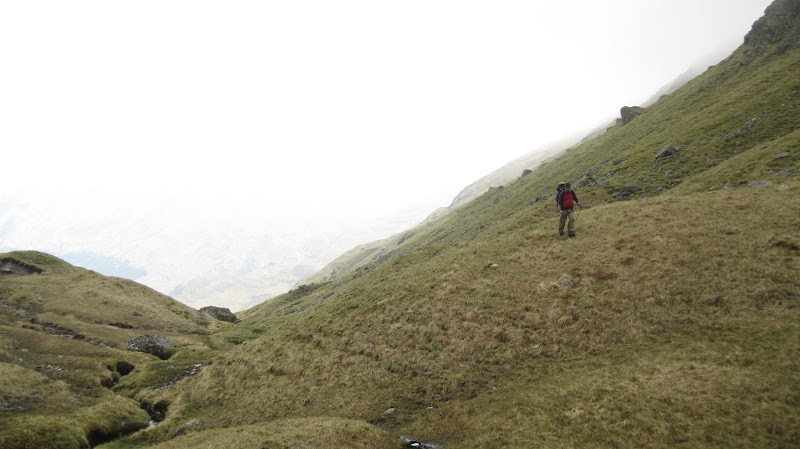 We eventually crossed to this higher one due to the difficulty in negotiating the lower. We passed through the very pleasant area mentioned in the Cape Wrath book, which is indeed a great camping spot. It was somewhat spoilt by a bunch of loud ramblers on a route march. We gave the customary highland pleasantries but were completely ignored. Maybe Jim frightened them, maybe they were foreign, who knows. My money is on the latter. We had reached the point where you have no choice but to go off piste and climb up to the path into Barrisdale via Mam Unndalain. This is a punishing little climb with heavy packs and in hot weather and we were sweating buckets by the time we reached the path. As always that quick gain in height has its rewards if the weather allows and the views again made it worthwhile. 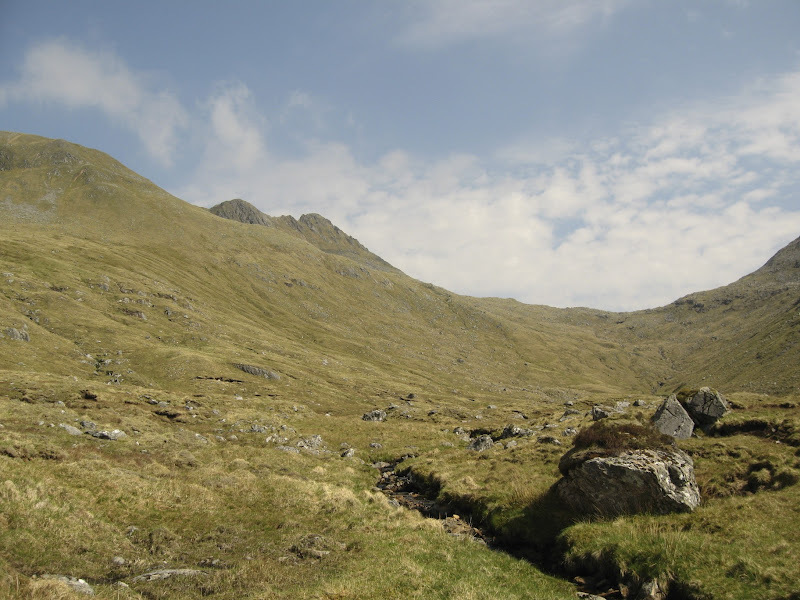 There was now a long walk up to the bealach and down Glenn Unndalain to Barrisdale. By the time we arrived we were again very spread out on the track. We had booked the Whitehouse for the night and Rob and Jim had reached the place, dumped their packs, headed down to the farm about half a mile beyond to collect the keys and were on their way back in a landrover with a bag of coal. Simon was another 15 minutes behind me; god only knows what he had been doing. The Whitehouse was great and well worth booking if you are in Barrisdale. It sleeps a good deal more than just four so we were rattling around the place somewhat. Jim had saved half the bottle of single malt, so we helped him finish it. Weight saving we told him. 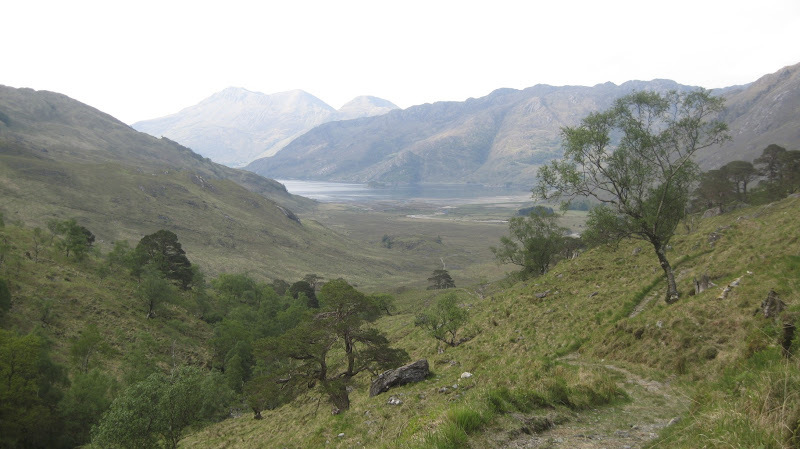 We were back on schedule and had planned a short day going up to Kinloch Hourn where we had booked the B+B. The weather was fantastic and the scenery equally so. 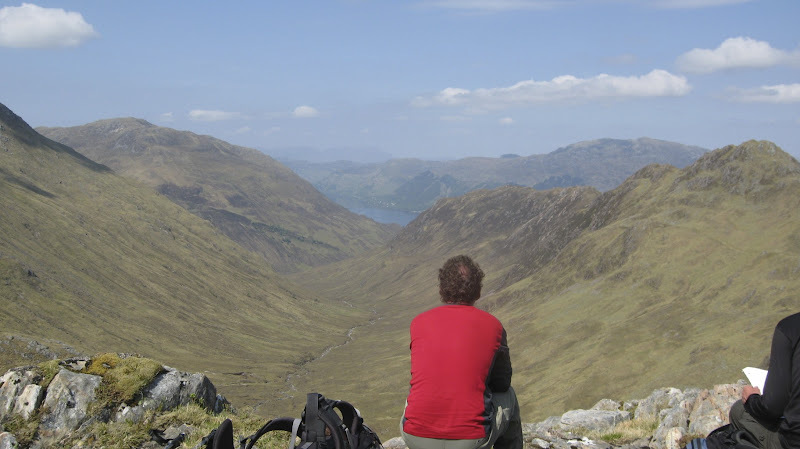 The view down Loch Hourne was well worth the effort made in getting here. Ben Sgritheall in the distance clearly visible. 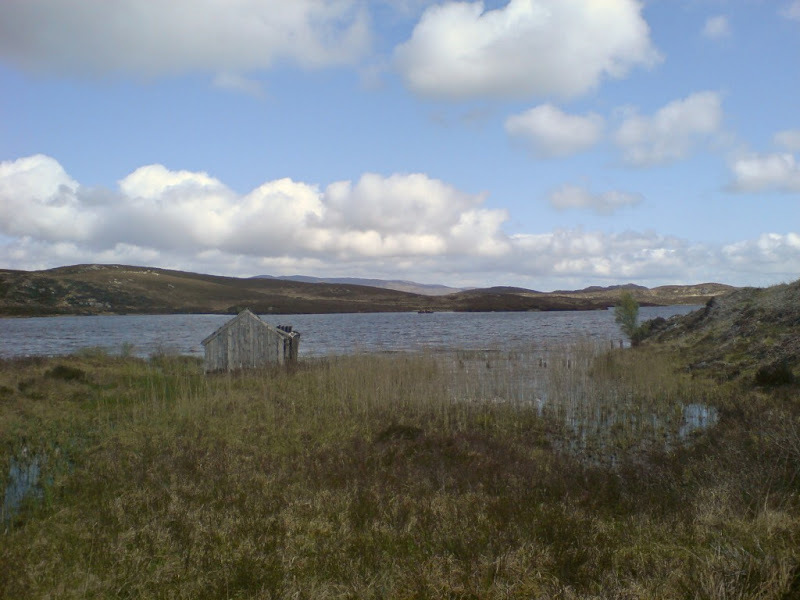 A relatively leisurely stroll along Loch Beag followed. We were hungry for some protein and stopped to gather mussels from the loch, which tasted great. Further up the loch the Saddle could be seen and as we reached the B+B we were greeted by two RAF helicopters zipping by. It was a hot day and we raided the little B+B café drinking most of their stock of ice cold coke and mars bars, aswell as the cakes and coffee. After an entertaining evening in the B+B followed by a great breakfast we set off for the Kintail Lodge Hotel where we had booked the wee bunkhouse. There are several routes out in that direction, but we elected to follow the electricity pylons via the Kinlochourn Forest, crossing the Alt a Coire Reidh, skirting around Sgurr na Seigne and up to the bealach Coire Mhalagain, below as most of you will know the Forcan Ridge. The paths were very easy although a bit of a climb, the walk made slightly harder by the heat as yet again the weather was great. 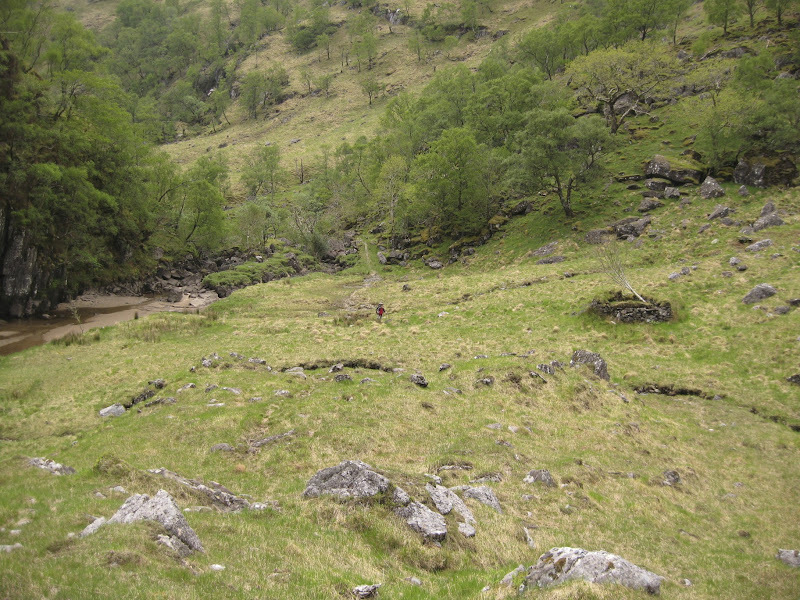 It was surprising that beyond the Alt Coire Mhalagain river crossing, what was an excellent path simple ceases to be. There was not the faintest whiff of a path on the other side. It was therefore back to the every man for himself, off piste, crawl up to the bealach. It was a bit of a double expletive climb in the heat. The views were outstanding however. We couldn’t see anyone on the ridge, which given the weather seemed odd, there were several on Sgurr na Seigne, so they may have been doing the round. It was about midday when we finally got to the bealach. The path along the wall on the other side was much easier and we made it over to the bealach ne Craoibhe before stopping again. 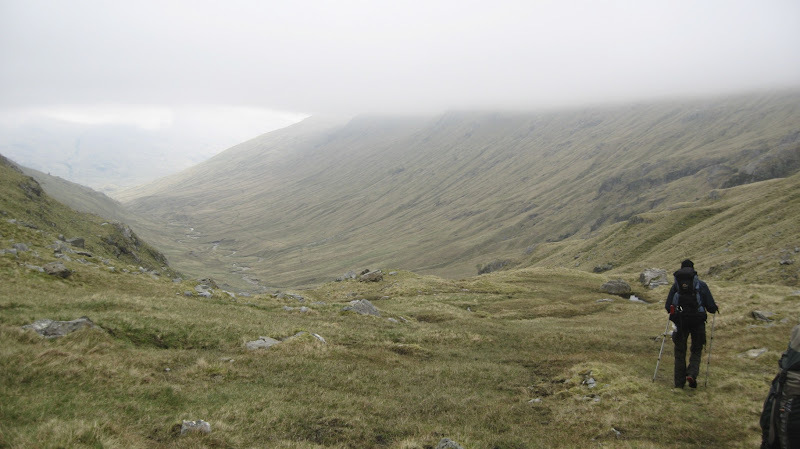 We met a lone guy coming down off the Forcan ridge here. He was beaming from ear to ear and I think desperate to tell someone about it. I don’t think there could have been a better day to do it and I was a little jealous of him. However, I was also knackered and in no fit state to take it on. Rob and Simon decided to take the ridge walk down to Shiel Bridge via Bod an Fhithich, Jim and myself elected to go down Coire Caol instead. It was really hot by now and with the humidity the camera had condensation on the lens. We not surprisingly reached the campsite first. 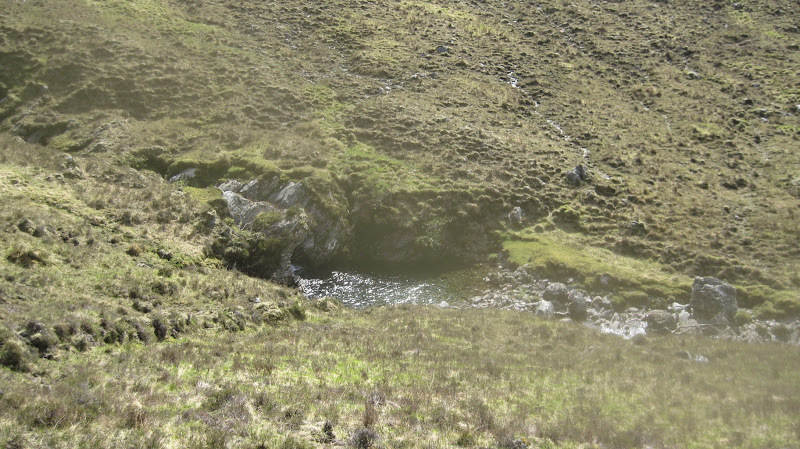 There was a great pool on the Alt Choire Chaoil with looked really inviting. Jim however could smell lager and was in no mood to stop. The pace was relentless and I took a couple of tumbles trying to keep up with him. We stopped at the garage and rehydrated, I had a coke or two, the last thing I wanted was alcohol. Rob and Simon arrived after about half an hour, they said it was an easy route and they could see us in the Glen, but no way could they keep up with us. This day had in hindsight a great deal of significance for all of us. 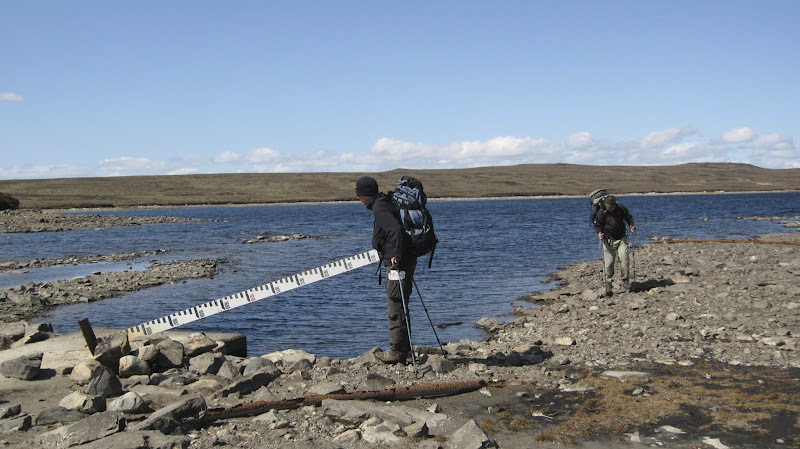 It wasn’t like an epiphany or anything but it was the start of Rob and Simons munro bagging. We had been doing long distance trails since 2002 and had slowly been going higher and higher. Skirting around the Forcan ridge and seeing the guy earlier in the day had convinced them to start climbing themselves. I managed for a number of reasons to resist this urge until May of this year 2012, by which time they were reaching 100 each. But you can’t hold out forever and if you can’t beat them join them (as you can see, I have a lot of catching up to do!). 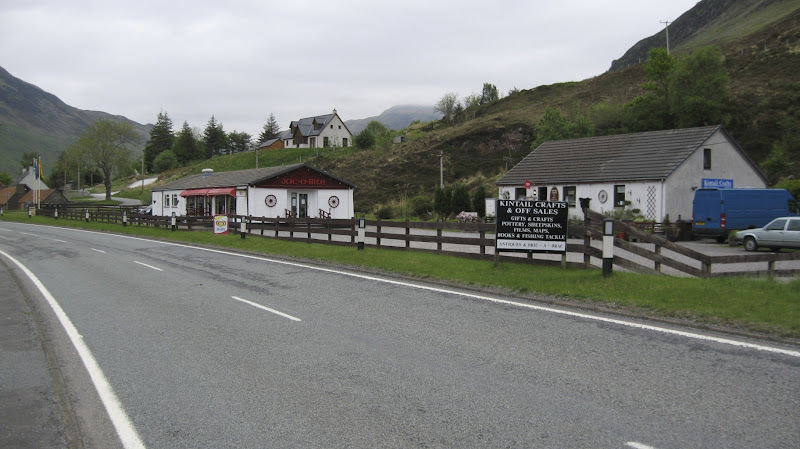 Anyway we finished up at the Kintail Lodge Hotel where we stayed in the garage or wee bunkhouse as they call it. 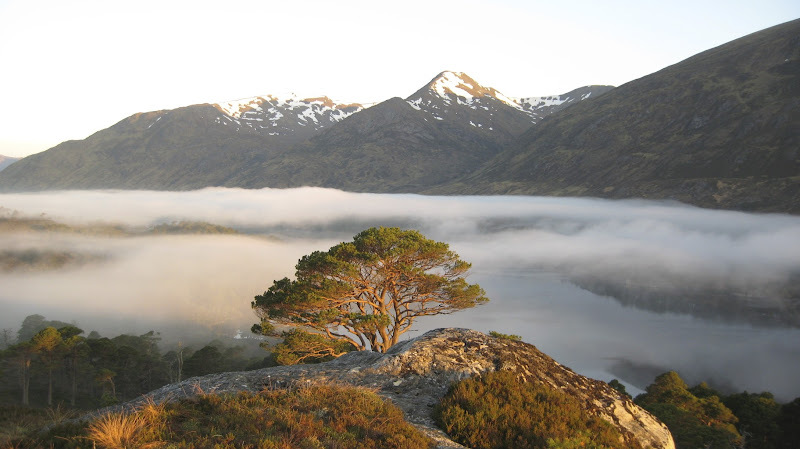 Wasn’t half bad to be honest and we collected a parcel here to restock before heading towards Glen Affric. Walked past the Jac O Bite (how we laughed). 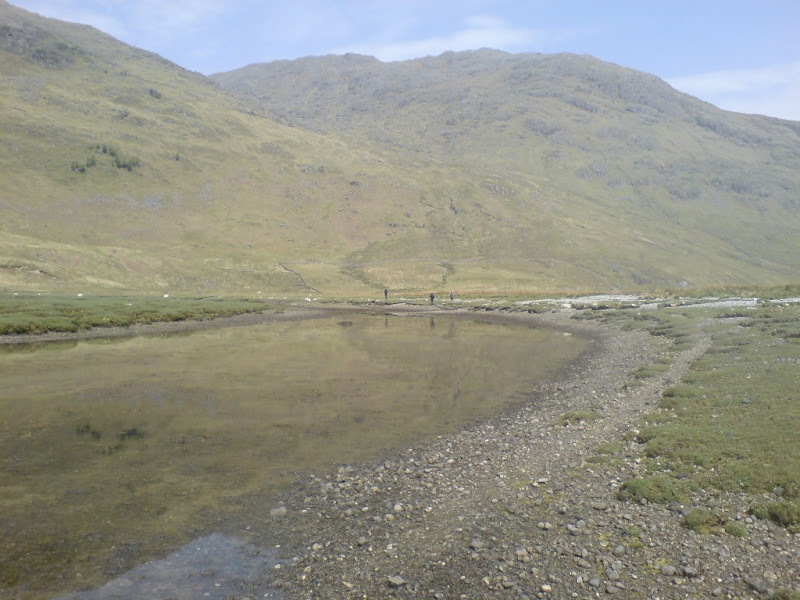 Through Morvich and down Glen Lichd. 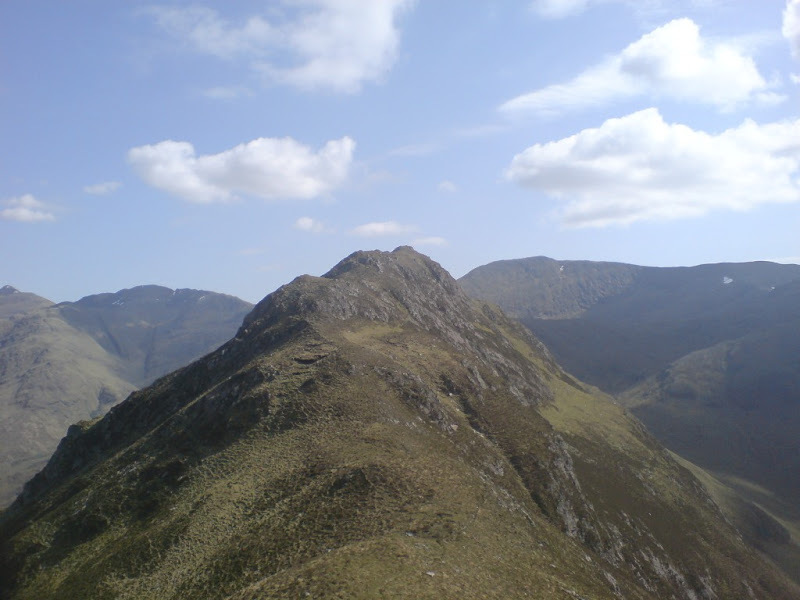 This is yet another gem situated between the five sisters and Ben Fhada. I would have to admit that it is difficult to see how this could be fitted into the CWT. After all from Morvich you would go on to the fall of Glomach. It could be used if you take the Glen Garry route we had tried the previous year. 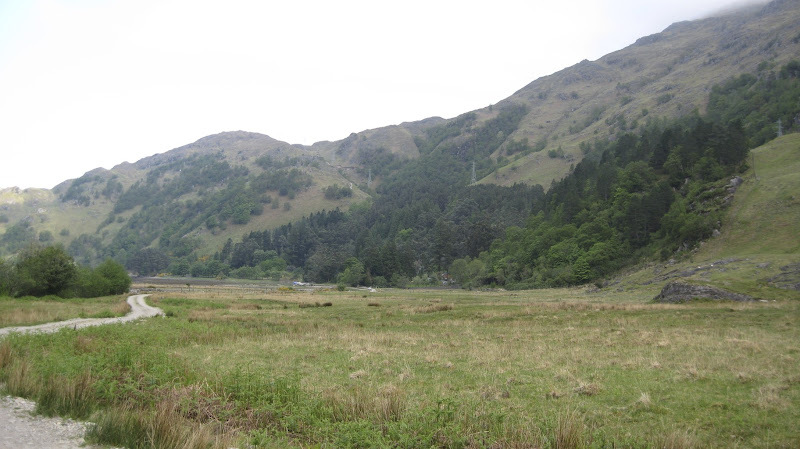 The route starts to climb beyond Glenlicht House and heads towards Camban Bothy (spooky) before crossing to Altbeithe Youth Hostel. 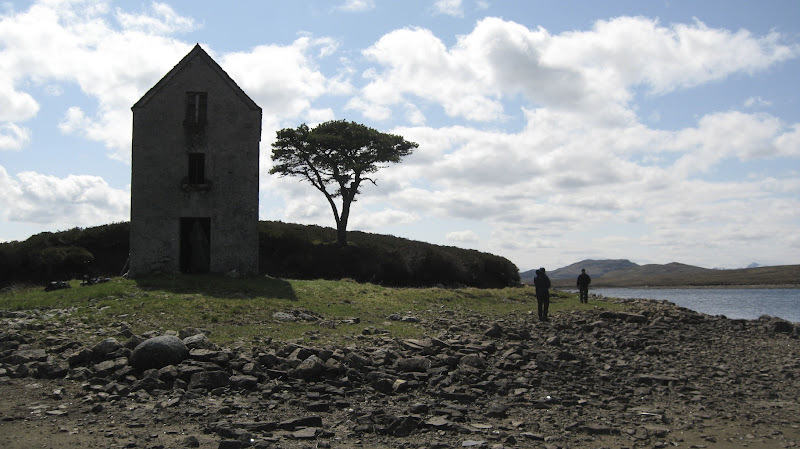 Despite its great location I didn’t much care for Camban Bothy and had to come out as soon as walking in the door, something not quite right there. Jim was of course itching to get to the hostel, I cannot imagine why. We were not planning to stay at the hostel and already knew a party of school kids had booked it out. We arrived to find a different manager in place and no beer to be had. This was made worse for Jim by the sight of the schoolteachers tucking in to a box of wine no less! It turned out (allegedly) the previous manager may have been not entirely honest with the beer profits. Hence the wry smile last time we were there, surely not. Jim was clearly not amused by this one bit. 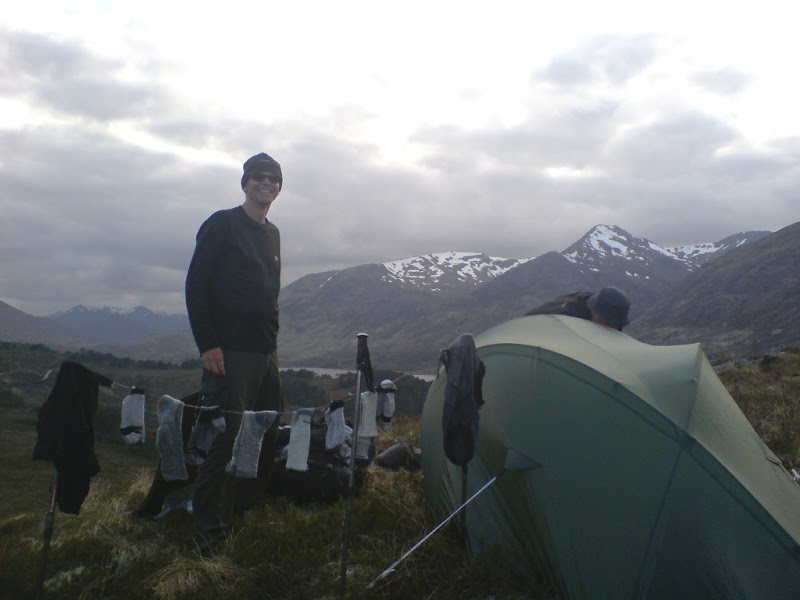 We pressed on to Loch Affric and set up camp on a knoll overlooking the loch. 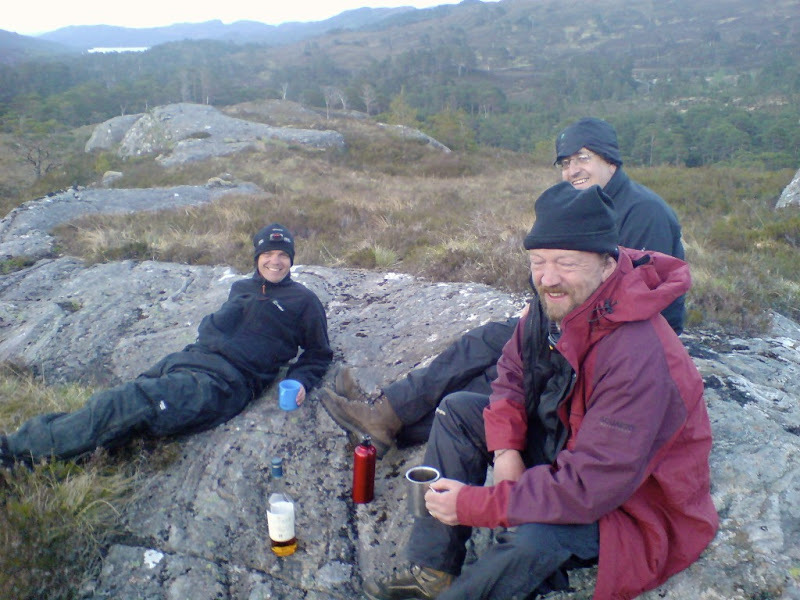 As this was our last night wild camping and as I felt a bit sorry for Jim I produced a bottle of Talisker from my rucksack, much to his and everyone else’s delight. I was a superb camping spot for sure with amazing views all round. Needless to say by the time we turned in it was both dark and the bottle was empty. 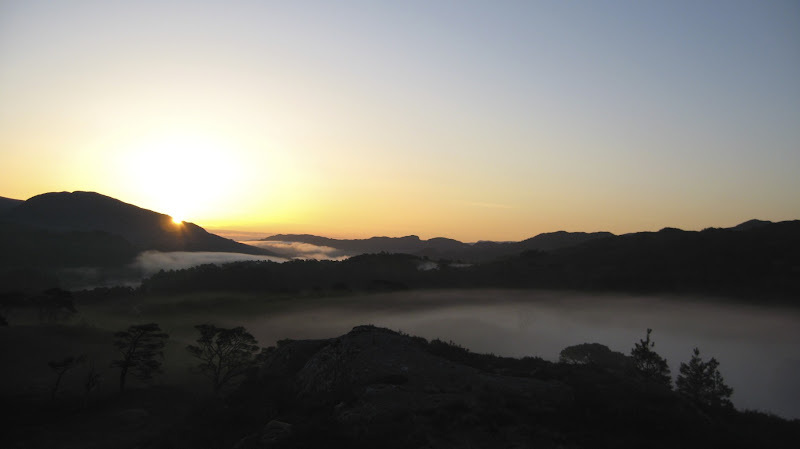 For some reason I awoke very early and ventured outside, it was about 4am and dawn was breaking. What followed was the most astonishing sunrise I have ever seen. The photos just don’t do it justice, words don’t either, it was utterly quiet, not a soul around. 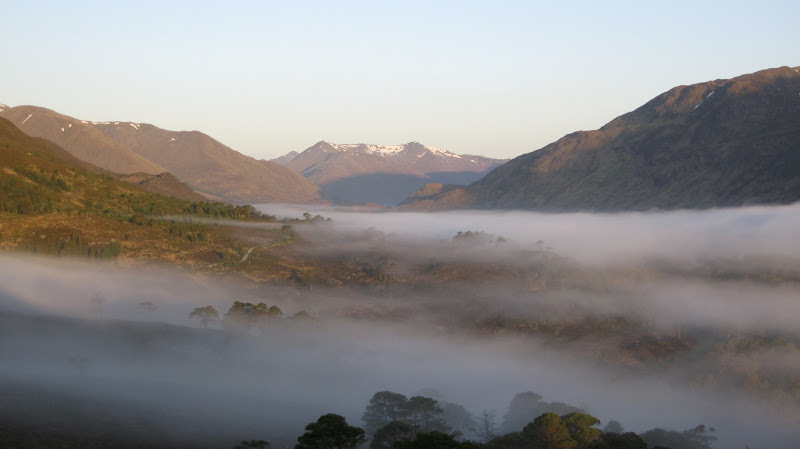 Just a magical sight, the mist hugging the floor of the glen, the snow capped mountains and the clear blue sky above. 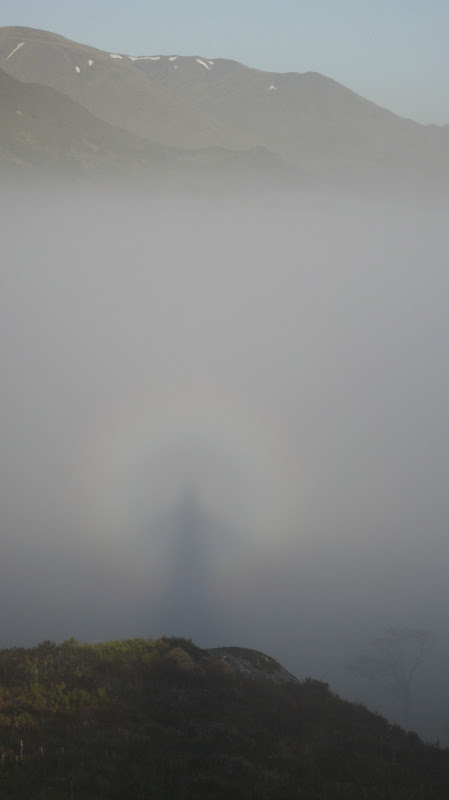 To cap it all I even had a brocken spectre of all things and a very good one at that. I went back to sleep for a few hours before the others awoke and we set off for the Tomich hotel. 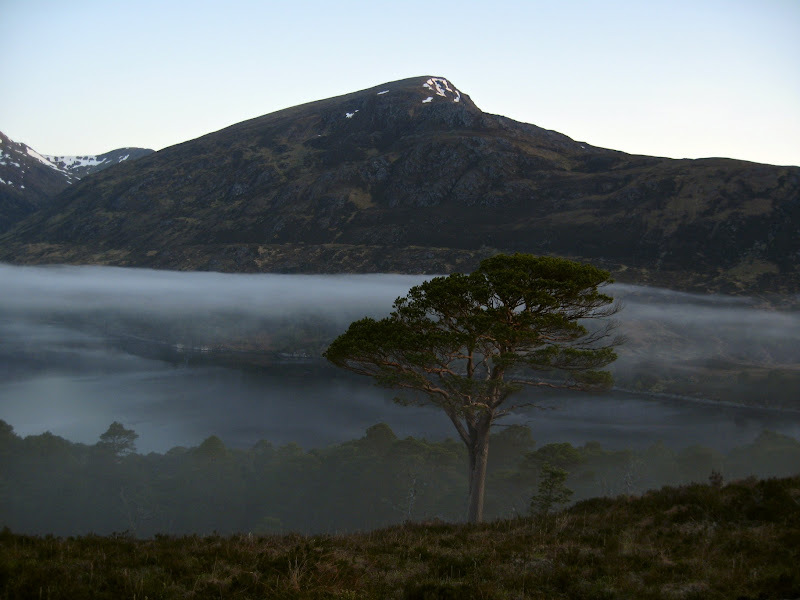 We headed for the car park at the head of Loch Affric, mainly to use the available facilities. There were a lot of day walkers there, eyeing us up warily. 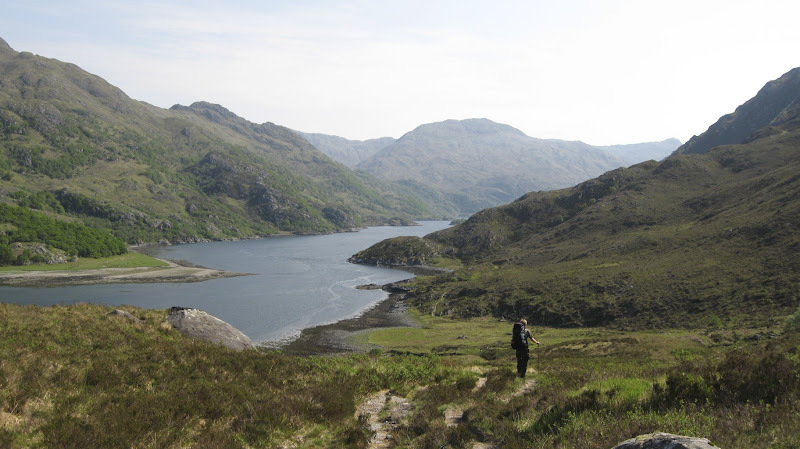 We then headed back over to the south side of the loch and walked up Loch Beinn a Mheadhoin to just beyond Carn na Glas-leitire where the path deviates and heads across to Tomich via Innis Bhuidhe. The Tomich is a popular little hotel, which is nearly as good as the Tomdoun and is therefore a creditable second on my list of top highland hotels. There were a number of fishermen staying there, but they were after trout not salmon and were not quite so posh as those at the Bridge of Orchy or didn’t feel the need to act posh. This was the last day of the walk and everyone was feeling the usual depression with the thought of returning to work. This was potentially going to be a fairly dull section, however apart from the very final road walk this wasn’t the case. 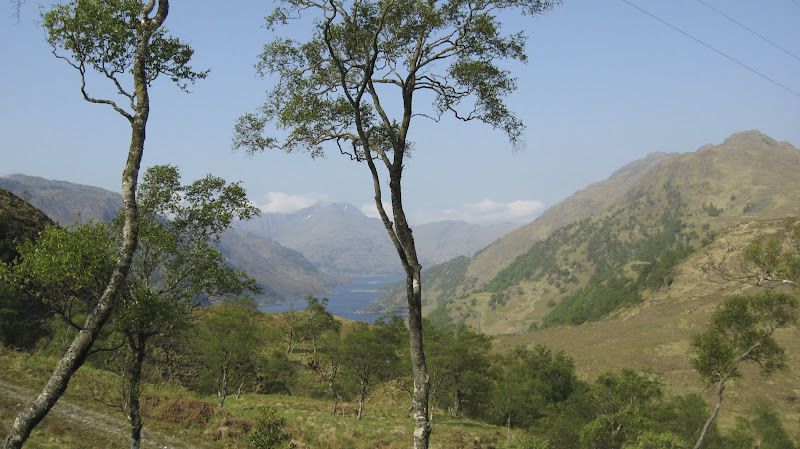 We set off for the loch that the fisherman were using at Sidhean Mor namely Loch na Beinne Mor and then crossed through the plantation of pines to the river Enrick in Glen Urqhart. 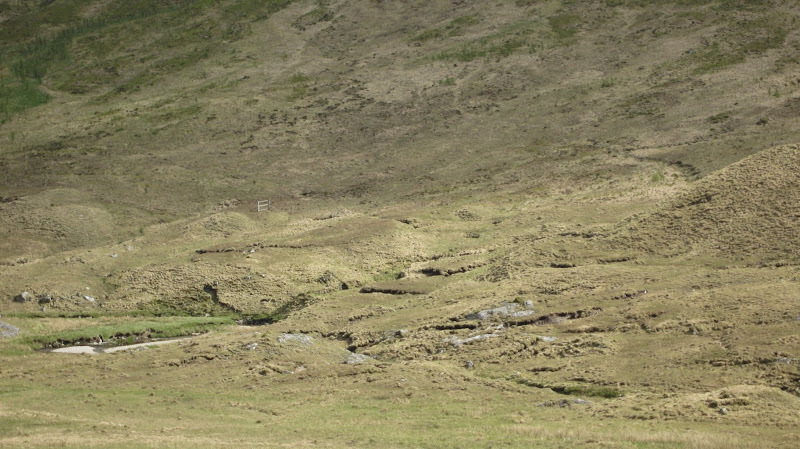 There was a bothy up here, which looked in good order, but I was puzzled as to who would use it. 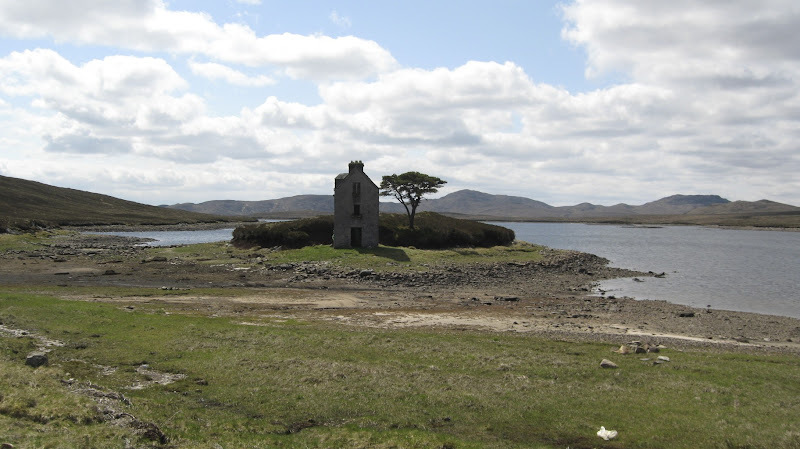 After a rest we headed for Loch ma Stac where we were met with the unexpected sight of a ruin on a small island in the loch. Not quite Eileen Donan but I bet the parking charges would be less (had there been a car park, or indeed a road for that matter) I could visualize an atmospheric album cover here, U2 perhaps. After wandering around the island for a while we set off for the good track on the far side of the loch which runs down to the A887 at Bhlaraidh via the Bhlaraidh reservoir. 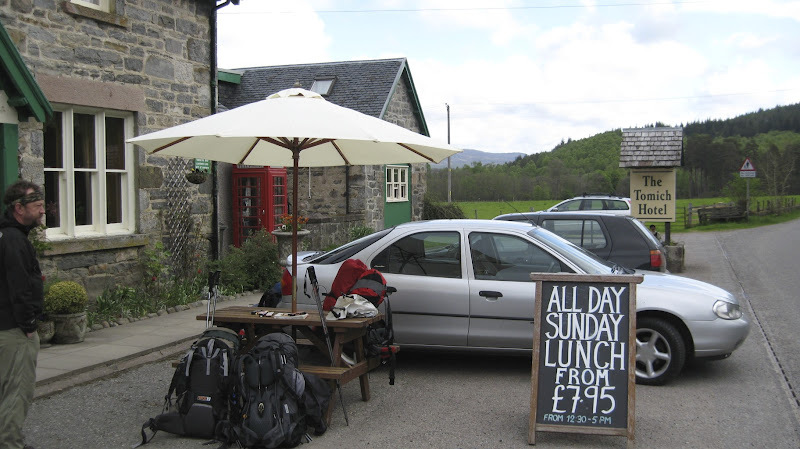 This was the final point of interest and there then followed a route march up to the Glenmoriston Arms Hotel. We were quite looking forward to our final night at the hotel. 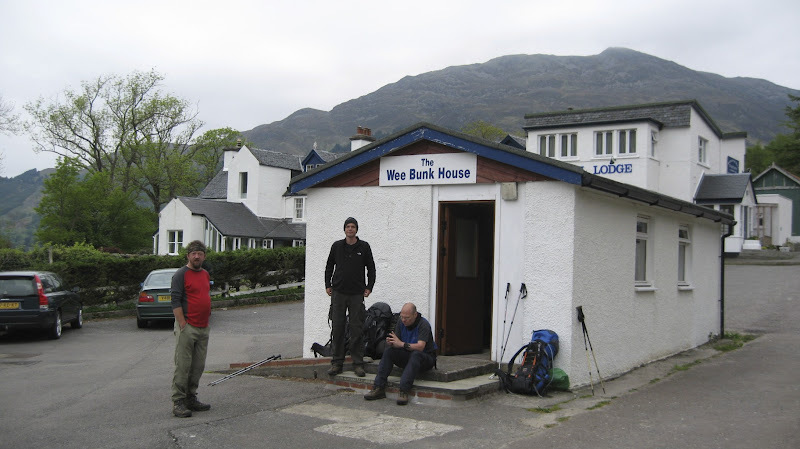 We had visited it before when doing the Great Glen Way in 2004. That was an epic night for sure; Jim befriended a wealthy Japanese collector of single malts and the pair of them went on a tasting tour of the bars extensive collection. This culminated in an extremely expensive 40 year old single malt being thrust into my hands for me to give my verdict. One very drunk Scotsman and an even more drunk Japanese man were both very upset when I told them it wasn’t as good as the ten year old I had tried earlier. I left them to it and went to bed. The owner of the hotel told us at breakfast the next day that he had never ever seen someone drink as much as Jim had the night before. I was dubious as I’ve seen worse on a rugby tour. We reached the hotel to find that it had changed hands and it was no where near as good as it had been, a major let down. The next day we took a taxi to Inverness and home. That was the CWT done and dusted for sure. This route had passed by with few incidents. The weather was great, we hadn’t got lost and we had kept pretty much to schedule. Frequent use of the map helped. 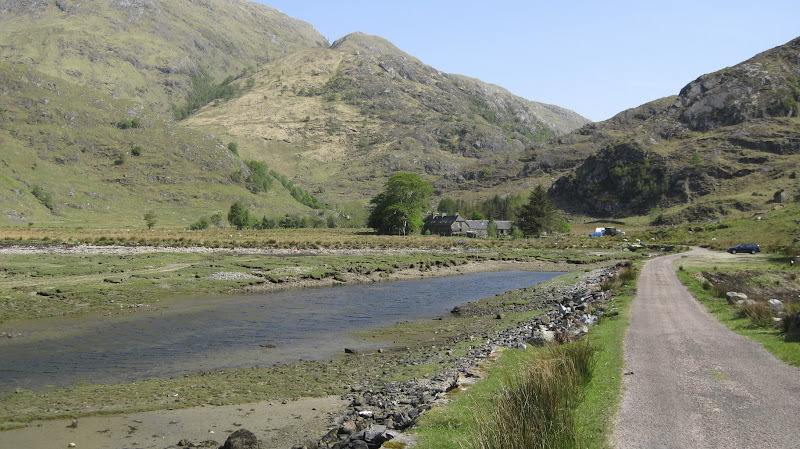 Picking the best route overall is a tough call, but I think if I walk the whole route again I would go via the Corran ferry and Cona Glen, up through Knoydart, Shiel Bridge and Morvich as this provides the most interest with the scenery. The rest of the route being the CWT 1. I have all the photos on Picasa if anyone want to see them. Looking at other peoples photos is pretty dull of course, but it can be helpful with route planning. I certainly helps me when I am planning a trip. 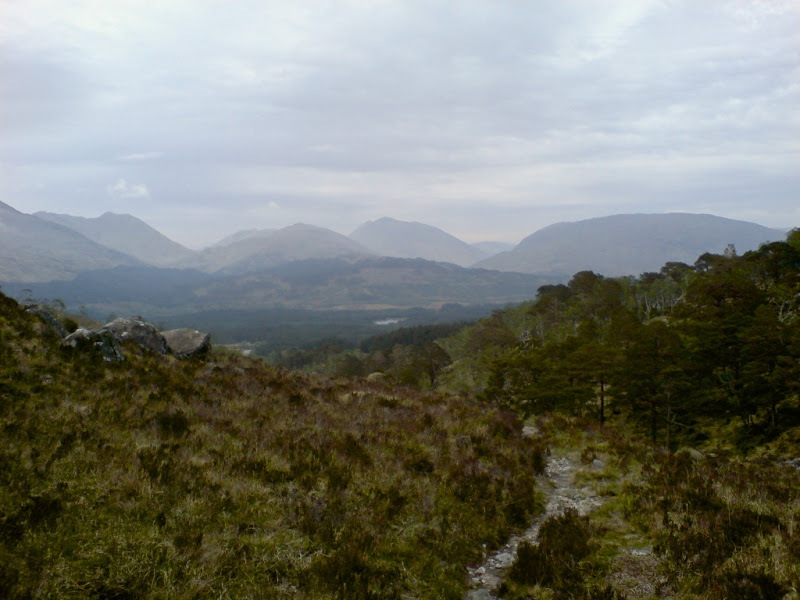 I would highly recommend a walk through Glen Affric and using our route out to Invermoriston is not a bad one, but it does link with the Great Glen Way and then to Fort William or Inverness. 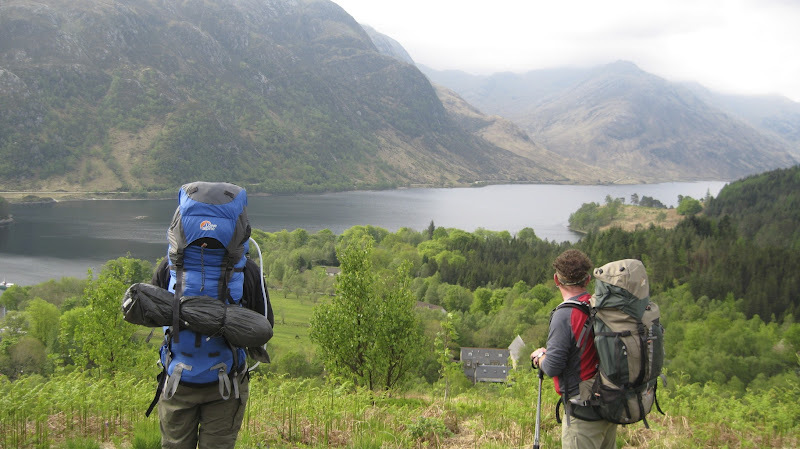 Having walked the Great Glen Way in September 2004, I can say that I am glad I’ve done it. 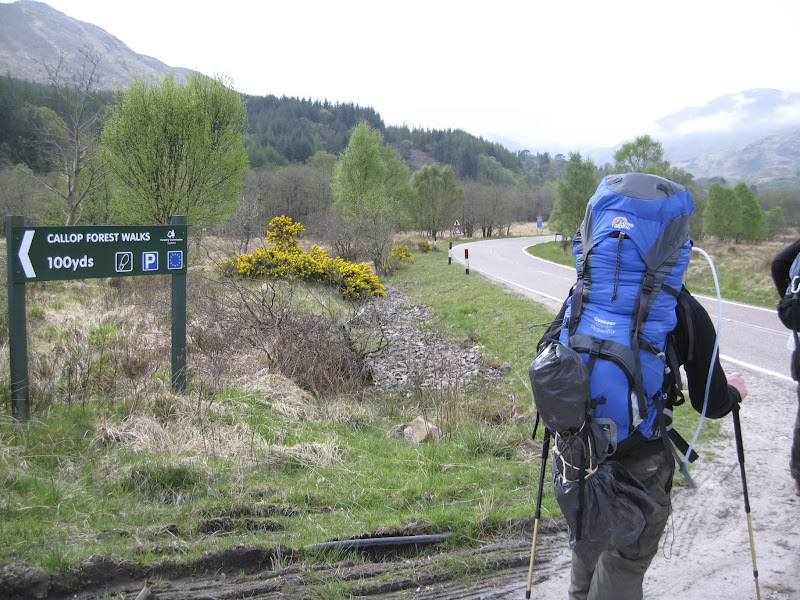 But unlike the Cape Wrath Trail and indeed West Highland Way (planning a third trip with the kids) I wouldn’t do it again. 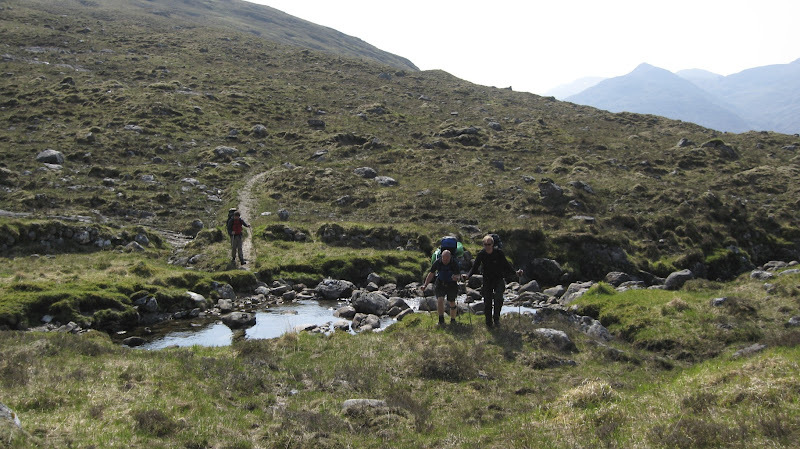 For anyone thinking about doing the Cape Wrath Trail I would urge you to get on and do it. Every year it becomes a little more popular, which means more people doing it. If you have done the WHW then you will know you tend to keep time with the same groups of walkers who started at the same time as you. This could be a little tedious on the CWT, especially if you value the remote feel of such a walk. Over the three years from 2006 to 2008 we didn’t meet anyone else doing it, and we were walking in the opposite direction to the one most people would use. Hope you have enjoyed reading all of this, my apologies if it has been a bit too personal.